I had to wake up to the alarm again today--this time at 5:00 a.m. I think Jerry was relieved that it was my alarm, and not his--so he could sleep in today :) I had my sports med appointment today at 7:00, and it takes about 45 minutes to drive there, so I had to leave at 6:00. I had a quick cup of coffee before heading out. When I got there, they gave me the usual forms to fill out, but I hadn't even completed the front of the first page when I was called in to see the doctor. Then the doc came in almost immediately--awesome! That's a bonus to having a 7:00 appointment, I guess. I explained to him all that was going on with my knee: when I first had the pain (April 5th), exactly where it was and what it felt like, and anything else that I thought might help. I even brought my Adrenaline shoes with me to make sure I was wearing the proper shoes for my feet. He watched me walk, and then pushed and prodded my knee and leg, maneuvering it in all different directions to see where the pain was originating. In the end, he said that I have BOTH iliotibial band syndrome (ITBS) and patellofemoral pain syndrome ("runner's knee"). The runner's knee is what is causing the most pain, however. It's funny that he diagnosed me with both issues--because when reading about each syndrome online, I couldn't decide which set of symptoms described my pain better--they both sounded like what I had going on. It never occurred to me that it could be both! He suggested I take 4-6 weeks off of running and do something like biking or elliptical instead. I told him that I had just started training for another marathon, and I told him about the training schedule. I asked if I could still do it, or is it uber important to take the time off completely. He said it depends how much this particular race means to me, and that I should listen to my body. I can run, but if my knee starts to hurt, I should stop. I shouldn't run through pain. He also said I should do treadmill or track running, since the surface isn't as hard on impact. He gave me a script for physical therapy, as well as a packet of exercises and an elastic exercise band to use to strengthen my leg muscles. He also ordered x-rays, which I had done before I left the building. All-in-all, I am glad I went. I didn't really learn much that I didn't already know, but it was nice to confirm what I believed. And I am glad he gave me the option to still do the marathon if I listen to my body and take it easy as needed. I'm going to try and continue training, but if it gets horrible like it did before, I'm going to take the recommended 4-6 weeks off of running, even if it means missing the marathon. Luckily, it's been getting better recently, so with the additional exercises he gave me to do, hopefully it will continue to get better. If only I could have such consistency when running outside! While I was running, Jerry went and got doughnuts for breakfast. He's been working a lot lately, so it was good to be able to have breakfast together, especially a treat like fresh doughnuts! I already explained that there is a new bakery near us with amazing goodies. When they first opened, I bought some for the family, but I passed one up. Today I felt fine about eating one because I had a good run beforehand. I told Jerry I wanted something with frosting--like a frosting-filled one. He said when he got there, there was one that was peanut butter cream filled, so he picked out that instead. He knows me SO well--if I had known that was an option, I totally would have picked it! It's kind of funny, I was never a doughnut fan until April of 2011. Even at my heaviest, I would pass up doughnuts in a heartbeat because I just didn't like them. But when I was on vacation in Tennessee, I tried a Krispy Kreme, and it was all over from there ;) Anyway, Jerry and I sat on the porch with coffee and our doughnuts, and had a nice chat over breakfast. Everything was delicious, but when I tasted the rice, I was positive it tasted like they cooked it in chicken broth. I asked the server, and he confirmed that it was cooked in chicken broth. They definitely shouldn't have put that on the vegetarian menu! I didn't eat it, and they applied a $2 discount to the bill, which was cool of them. I hope they amend the menu for other people who may think they are eating vegetarian rice. It was so nice to spend the whole day with the family today. It definitely felt like a weekend, with the doughnut-breakfast, shopping, and eating lunch out. Then we cooked on the grill for dinner. The day totally flew by! I don't know anything about anything, so you sure don't have to listen to me, but your doctor's advice sounds pretty good. I was surprised when I read that you were going to train for another marathon, since you had such knee pain. To me, well, I run because it burns calories. I'm still in the losing phase right now (83 of 105 goal), but like you, I want to be able to maintain and still eat some fun things one day. Running helps me do that. My biggest fear is not being able to run and then having a hard time losing and maintaining. So, I've decided not to do the long races. 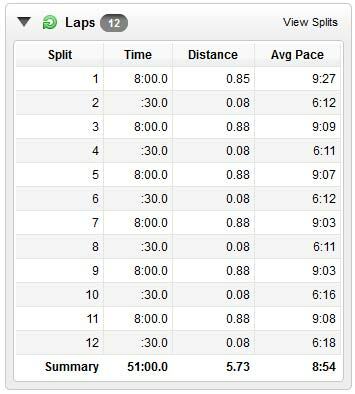 My goal right now is simply to get my pace down to 10 min. 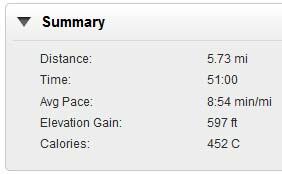 per mile, which is big for me, because although have endurance, I am naturally unspeedy. :D It seems that when I read about people moving beyond the 10K (which is an hour of running, for me, or will be soon, I hope -- I can do 2 miles at 10 min. but it takes me about 65 min. still to do 10K) that I start to see more injuries. I have runner's knee too. It always hurts my left more than my right. I went through a few weeks of pt for it. I have to say, it really helped! For me, I really needed to strengthen my glutes and hips. I also started doing Pilates to strengthen my core. All of it has helped so much! Good luck! I hope you find it helps you as well ! It's nice that you got some answers! It seems like you have a smart outlook. While it's important to rest and to take care of yourself, only you know your body and what feels right. I hope that later this year we'll be reading an update about your marathon and how great it went! I like mostly vegetarian dishes, as well. It's surprising how many "veggie" dishes have meat ingredients. Most pad thai has fish in it, which I didn't know until after pointedly eating it to avoid meat. I think I would have had a big problem with rice cooked in chicken broth being on the vegetarian section of a menu when I was vegetarian. That seems like a blatant lie to me, as chicken broth is obviously a meat product. If you had just ordered rice from a normal menu, without it being labeled, that would be a bit different. Sounds like a good visit. If I were in your shoes, I'd probably do the same thing you are. I'm curious, if you mentioned the foam rolling and if he thought it was helpful. I've had IT band issues that gave me pain at the other end, the hip, for almost 3 years now and I am just now starting to get through it. Let me suggest this stretch. I've been through several rounds of PT before I found the right stretch that worked for me. Basically, legs crossed, then bend down toward your toes. To really feel it in your IT band, lean to one side (i.e. if your left leg is in back, lean to the right). I've added this to my running cooldown and it's worked wonders. Good luck! Glad you were able to figure out what is going on with your knees. I am new to running and just at the start of my weight loss journey. I ran pretty hard last night during the run intervals on the C25K and my knees are killing me today. Did you have a lot of pain when you started running? It might be that I'm at a pretty heavy weight; I'm hoping that it gets better as I lose. I just injured my knee two-three days ago and am taking off a week off running. This is the first time this ever happens (I never kept up with running though I love it) so I was afraid it'd mean the end of my "running" career. I'm glad the doc said to listen to your body and not just pile you up next to all the other runners. We are all different. Hope your knee works with you! P.S. What marathon training program are you using now? Sorry if you've already told me - I don't know how to set comments so I see replies!! It sounds like you found out what you need to do so the visit went nicely. That sampler looks really delicious. I would find it very difficult to eat vegetarian. Definitely listen to your doc and bod. I have a friend who was going to run a marathon but her knee pain got debilitating which made her only want to push harder. Finally the doc said she needed to nix the marathon and do biking to build up the knee. It crushed her but she listened and now within 6 weeks, her knee is completely strong and she's back to running and keeping up the biking to keep the knee in line. Donuts are my weakness. We have a local place that does the peanut butter filled, chocolate iced. Heaven. I really should eat breakfast now. Glad that you got some answers and that you have a plan of attack now. I highly recommend booking some PT sessions, especially if you plan on keeping up with your training schedule. I've done PT twice for two different issues (knee problems and then this spring a stress fracture). Both times they have had me back running in about 6 weeks with no pain. They know just what muscles to build up and just how to do it. Ditto on the veggie plate looking delicious! It's always nice to confirm your thoughts so there's no more doubt, even though we can't stand doctor visits - yuck! Sounds like you got some valuable information at your doctor's appointment! I've been through both of these issues so here's what I found out that worked for me. It really helped me when I was having some knee issues. Yeah, girl... Krispy Kreme rocks and will definitely make a doughnut lover out of you! I live in NC where the franchise was started and there is no shortage here, they are absolutely my favorite donut maker!! Hope your knee feels better, keep taking it slow like the dr. ordered! I hate when I go to the doc only to not get ground shattering news, haha. And Krispy Kreme is so good! For my birthday after my run, Dan surprised me with a Krispy Kreme donut! haha! Thank goodness they have Krispy Kreme in Japan! BTW, I'm really shocked that restaurant serves chicken broth cooked rice on a vegetarian menu. People with certain beliefs/ allergies can get sick or upset over something like that! !